What are the best paper towel holders to buy this year? Paper towels need to be appropriately kept where they don’t get wet but remain easily accessible. We use them more often when our hands get wet, and the last thing we want is to find them hard to access. This is where the paper towel holders come into place to help you out. Paper towel holders are pretty simple devices that help you grab the paper towels easily and cut out the right amount of the paper needed. In this post, we are going to share with you some of the top recommended paper towel holders in the market currently. Make sure you read our paper towel holders reviews before you make any purchase. 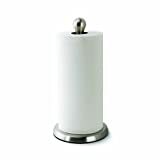 The OXO Good is a freestanding paper towel holder capable of accommodating any size of paper towel. It is a versatile choice on our list with a wide range of modern features. It features gleaming stainless steel construction and black plastic accents. The base is weighted to keep it stable on the countertop. For easy loading and release of the paper towel, the holder features a spring-loaded arm that allows for easy one-hand tearing. Overall, this is an excellent paper towel measuring 7 inches in diameter and 14 inches high. The Umbra paper towel holder is a modern and elegant design with a smooth nickel brushed finish and elegant lines. The holder features a patented unique shape design and curved rubber that help keep your paper towel secured. It is pretty easy to load and unload by smoothly sliding any size of paper towel. 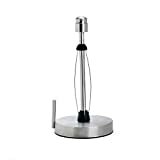 The base of the holder is weighted to maintain stability and padded to prevent scratching the countertop. This is another sturdy yet lightweight paper towel holder with a weighted base. The holder will never slide or tip over always keeping your paper towel safe and dry. It is a perfect fit for standard and jumbo sized paper towels. The holder measures 13 inches tall and has a diameter of 7 inches. 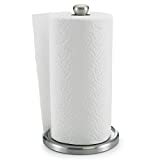 It is one exceptional paper towel holder that has some amazing reviews and recommendations online. It also comes with a satisfaction guarantee. 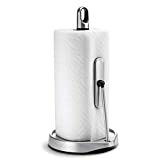 The Kamenstein towel paper holder features the perfect tear technology which is an ingenious system preventing the rolls from easily unraveling. It is one of the easiest holders out there with a weighted base and a one-handed operation. The holder allows for perfect pulling and tearing of the paper towel at the right size. It is a versatile holder with an interior wire roller that is designed to fit paper towels of all sizes. You also get to mount it with ease and replace paper towels with ease. 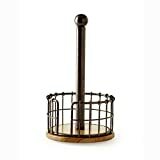 The Vremi paper towel holder is a freestanding countertop holder with a weighted base and a vertical metal to hold the paper towel. It is another excellent choice that holds small, medium and large sized paper towels measuring up to 5.5 inches wide and 12 inches tall. The body is the durable carbon steel while the base is the stainless steel metal to keep the holder stable on the table. It also features a round cover that helps keep towels dry from splashing waters. 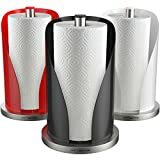 Overall, this is a modern paper towel holder coming in three distinct colors or red, white and black for you to choose from. 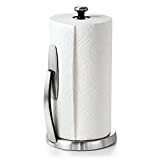 The simplehuman paper towel holder is a beautiful holder made of the highest quality materials. The holder features a weighted stainless steel base and rod keeping it stable and firm. It is an excellent choice for tearing just one piece of paper at a time. It features a variable tension arm that allows one sheet tearing at a time. A finger loop at the top allows for easy holding and picking of the holder. Overall, this is an excellent holder that loads easily by simply sliding in a new roll. This is a pretty simple wall mount paper towel holder with a standard dispenser holding medium and jumbo size paper towels. It is a versatile selection for mounting to the wall, under cabinets and doors. The holder helps save on the countertop space. It is a great way to free some space in the kitchen shelves, countertops and pantry. You can mount it vertically or horizontally without any problem. Overall, this is a standard paper towel holder that you should consider buying. It features a durable stainless steel finish that cleans easily with a simple wipe. This is an antique paper towel holder with a wooden base and an antique black wire holding the paper towel. 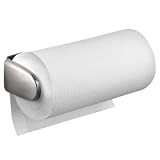 It is a pretty simple design that allows the paper towel to roll inside the holder easily. It is also a versatile holder that can accommodate both the standard and jumbo paper towels. The holder measures 13.25 inches high and 7.5 inches in diameter. You can easily wash it by hand and dry it using a towel. The GoodTurn paper towel holder is a pretty simple design with one-handed operation. It allows for fast tearing of sheets using one hand. The holder features a non-slip and extra weighted base that prevents slippage and tipping over. It works efficiently and cuts sheets without moving the entire paper towel. It is a perfect fit for jumbo rolls. You get a lifetime guarantee so go ahead and order with confidence. Kamenstein paper towel holders feature the perfect tear technology that prevents sheets from unraveling. This is Kamenstein is no different and makes a great addition to our list with a wide range of features. It is a quality holder designed to fit any size paper towel. It also features a weighted base and allows for one-handed operation. You can easily slide in a new paper towel without removing the initial piece. It is a perfect buy with a rust-resistant stainless steel metal. You’re guaranteed of quality. If you’re having trouble tearing your paper towel safely in the kitchen, then it is time you bought a paper towel holder. These are the best paper towel holders on the market, and you can be sure of getting value for your money. The paper towel holders are pretty cheap and will serve you well in the kitchen.